Some of you may know, I’ve had the pleasure of taking cooking classes at the New School of Cooking in Culver City. I have to give a shout out to my girl, Lindsay of Week Night Bite, for introducing me to this paradise for foodies. It has become such a joy to learn, cook and eat there! And one of the best parts, besides getting to eat like a queen, are the numerous, incredible recipes I get to take home. Following recipes has never been my thang, but I’m slowly learning it’s really not that bad. Plus, once you master a recipe, you can make it your own and have more fun and freedom with it! FOOD SHOULD BE FUN, right!?! This particular recipe is from the Healthy Cooking Class series, taught by the fabulous, Chef Jess Hilton. I really thought I ate enough vegetables, but after an assignment to start a food journal, I found out I was dead wrong. I’m always looking for new, interesting, flavorful vegetable recipes and this one has become one of my go-to’s. I can’t stop making it, and my husband now expects it to be in the fridge at all times, ha! It’s great on so many levels. Because we roast the carrots, they become ridiculously sweet (and good looking)–almost like candy. 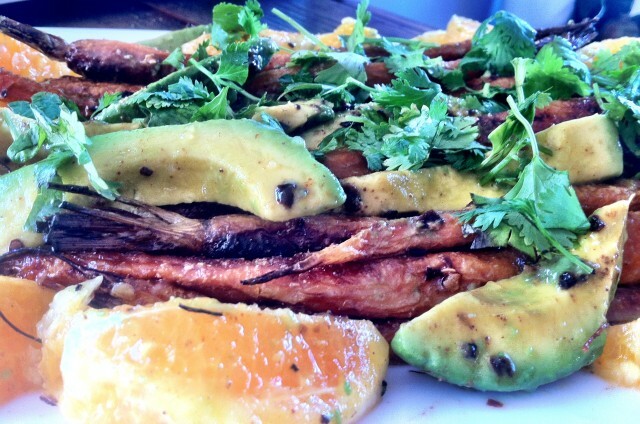 Then when you combine avocados and oranges—I mean, come on—you can’t go wrong! It’s affordable, available year round and beyond delicious. Chef Jess even eats it for breakfast! I couldn’t let another day go by without sharing this incredible recipe…enjoy! 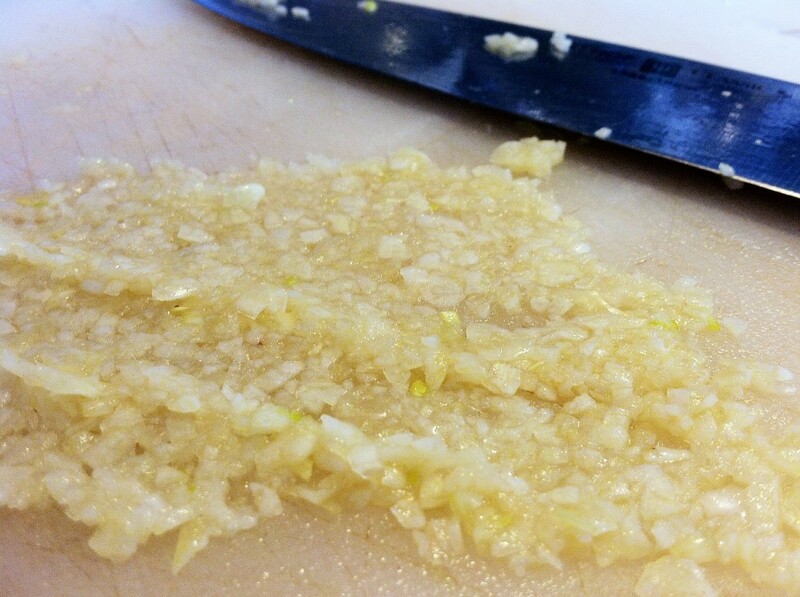 Pound the garlic with a healthy pinch on salt in a mortar until you have a wet, fairly smooth paste. You can also do this on a cutting board with a large knife, mincing and scraping. Put the paste in a large mixing bowl. Add the cumin, coriander, red pepper flakes, and 1/4 cup of the olive oil and stir well. Next, add the carrots and toss well so they’re coated with the oil and spices. Season with sea salt. Put the carrots in a large shallow baking dish in one layer. 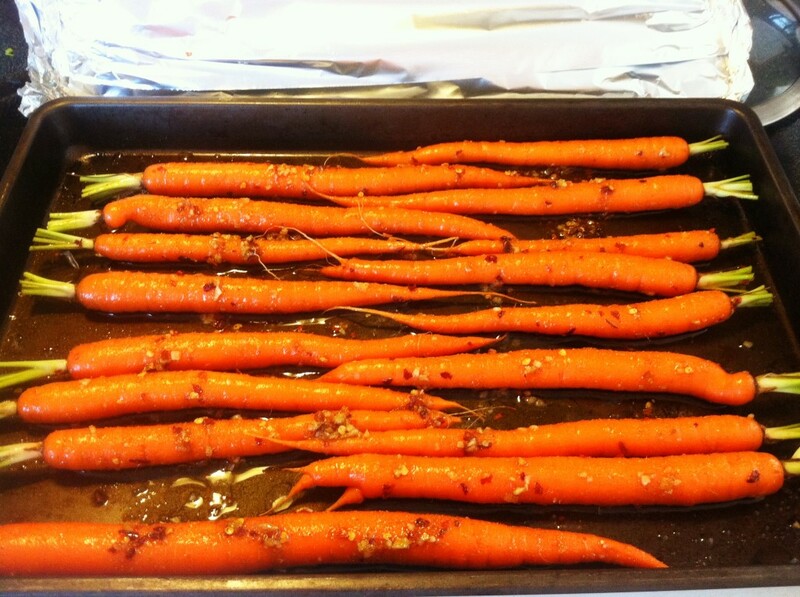 Scrape out the extra garlic, spices and oil from the bowl and spread evenly on top of the carrots. Pour 1/4 cup water into an empty spot in the dish (you don’t want to wash off the tasty oily stuff) and tilt the dish so the water spreads across the bottom. Cover the dish tightly with foil and put in the oven. 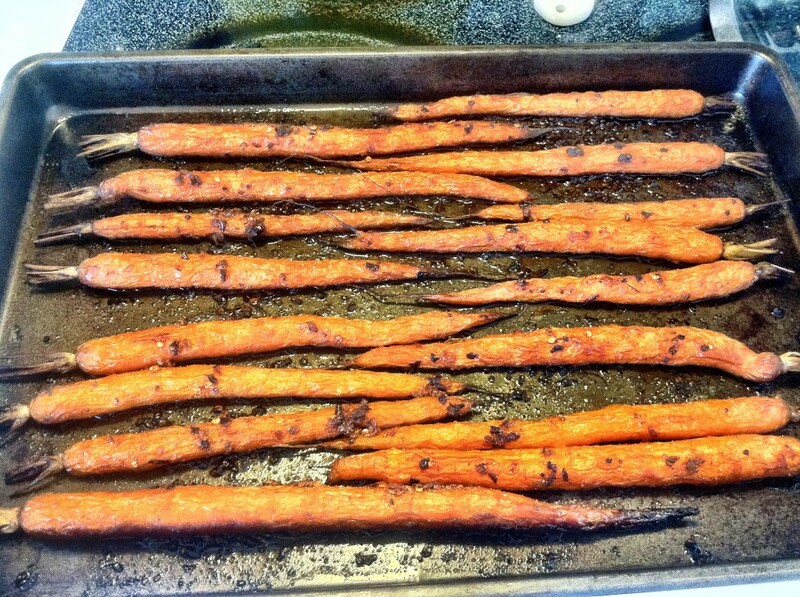 Cook the carrots for 25 minutes. Take off the foil and keep cooking until the carrots are lightly browned, and about as tender and creamy as avocado flesh, but not so soft that they threaten to fall apart, about 35 minutes more. 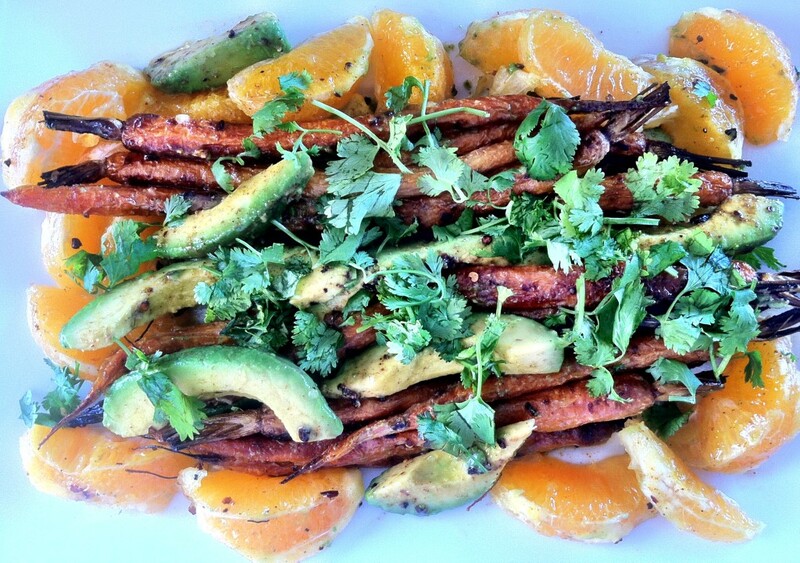 While the carrots are roasting, segment the orange as you would a lemon. Squeeze the membranes into a small bowl to release the juice. Set it aside. When the carrots are done, take the dish out of the oven and let it sit until the carrots have cooled a bit, but are still warm. Meanwhile, take the avocados from the fridge. Halve them lengthwise, remove the pits, and peel the halves. Cut the flesh lengthwise into slices about the same size of the carrots (only if you’re using the young carrots)–the slices should be sturdy enough that they don’t break up when you toss them. Put the avocado slices in a large mixing bowl and add the reserved orange juice, the lemon juice, the remaining 2 tablespoons of olive oil, and a healthy pinch or two of salt. Toss gently and well with your hands. 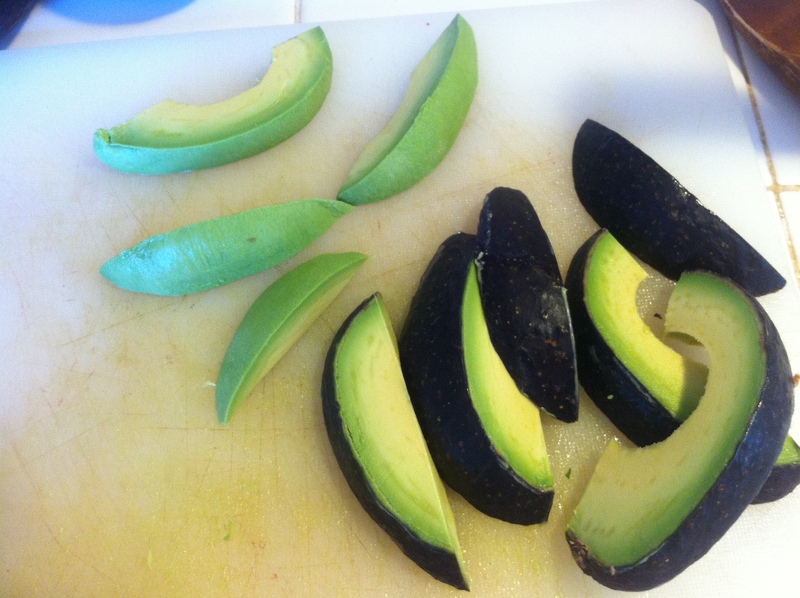 Push the avocado to one side of the bowl. Add the carrots a handful at a time, scraping and tossing them in the beautiful green liquid in the bowl before adding the next handful. 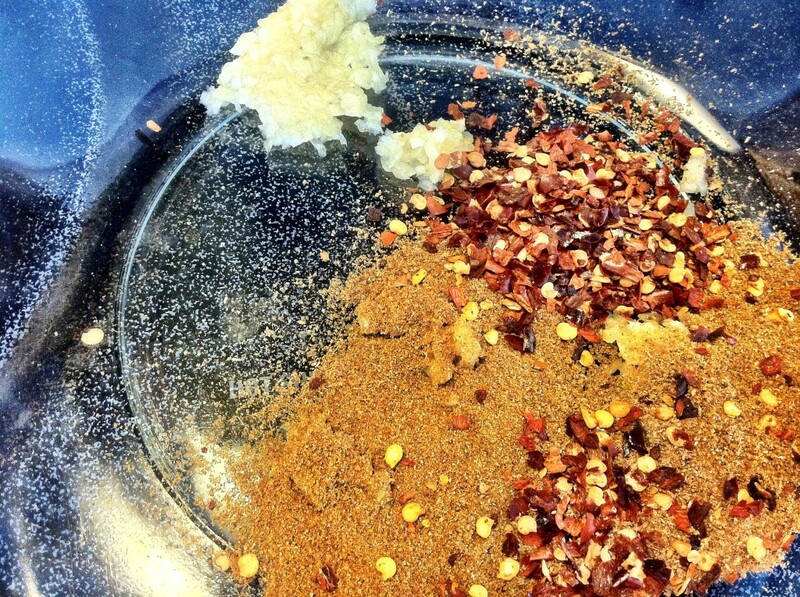 Make sure to scrape out and add all the garlicky spices left in the baking dish. Toss it all together gently, being careful not to break the avocado slices. Stack the carrots, avocado, and orange segments on a platter or in a serving bowl so they’re facing this way and that way. Top with the cilantro and serve right away. – I know it’s a long recipe, and can be a bit confusing, but do your best and make it your own! LOVE this recipe idea! So fresh, colorful, and yummy! I love this idea for Breakfast — I’m so in need for something different and healthy!! Thanks!